Winner Casino is a great choice for Ireland. New players can try out the site risk-free thanks to a no deposit bonus and there are plenty of other promotions available too. Our BettingTop10 review looks at everything you need to know including software, mobile gaming, game categories, banking, and more. Be sure to read our in depth guide before you visit the casino. Slots: There are more than 100 slots to choose from including classics and video slots. Popular titles include Jekyll & Hyde, Geisha Story, Land of Gold, Cops N’ Bandits, and Hot Gems. Arcades: This category including titles like Keno, Cash Blox, Rubik’s riches, 3 Clowns, and Party Line. These are fun and rewarding titles and great for some additional entertainment. Table Games: The table and cards category including several variations of roulette and blackjack as well as video poker titles like Jacks or Better. There is also a mahjong games as well as 3D roulette. Scratchcards: Instant win titles are great when you only have a few minutes to play and there are a number of titles to choose from including Santa Scratch, The Six Million Dollar Man scratch, and Irish Luck Scratch. Jackpots: Progressive jackpots are the games to win. These slots games come with life changing jackpots up for grabs and the site includes popular titles like Beach Life, Gladiator, Age of the Gods Series, and more. Live Dealer Games: In addition to great virtual games there is also a live casino with professional dealers. Players can choose from roulette, blackjack, and baccarat tables that are available 24/7 on desktop and mobile. To open a new player account all you have to do is click the join now button at the top of the page. A registration form will open and you have to fill in your name, DOB, email, mobile, username, and password. If you have a coupon code you can add it in this form too and then click the register button. Once registered you can make your first deposit and claim the welcome bonus. All new players who sign up for a real money account will receive a €30 no deposit bonus on registration. This will be added to your account immediately on sign up and is valid for one hour. During this time players can test out all the games risk-free. The wagering requirements are set at 50x and there are terms and conditions that we recommend you read first. If you like what you find you can make your first deposit and claim a 200% up to €350 welcome bonus. You must deposit a minimum of €40 and the wagering requirements for this bonus are set at 10x. You also get an additional bonus on your second deposit which is 60% up to €300 when you deposit €20 or more. Again, the wagering requirements are set at 10x. There are lots of other great promotions running at Winner casino including Free Spins Tuesday where you can get 60 free spins every week. Another great promotion is My Treasure Hunt and in this promo your casino bets will earn you points that sail your pirate ship towards the next level. Players get to buy bonuses at the famous Looter’s Market or Keys to open treasure chests. The casino has an excellent loyalty program where all players get comp points for every game they play and these can be converted into real cash. Loyalty points also help players become VIP members so be sure to visit the casino for more information on this. There are plenty of banking options available for players from Ireland including credit and debit cards, Neteller, Skrill, Ukash, Click2Pay, bank transfer, and more. The full list can be found on the website. Withdrawals are average and can take between 3 and 4 days. This is largely due to the pending period which slows things up. There is a withdrawal limit of €9,999 per month too which is the same across all Playtech casinos. Progressive jackpot wins are also included in these limits so if you win big it may take a while to get all your winnings. Winner Casino uses world leading software provider Playtech and offers download, instant play, and mobile gaming. They have virtual and live casino games as well as a fantastic no deposit bonus for new players. There are plenty of progressive jackpots up for grabs and the customer support is excellent. The site uses the latest SSL encryption technology and has an excellent loyalty program. There are plenty of banking options available too. The main thing that stands out is the withdrawal limits of €9,999 per month. This is not an issue for most but if you do happen to hit a progressive jackpot and win €1 million or more, you will receive your winnings in instalments. Withdrawals can be a little slower than some online casinos too and this is largely due to the pending period. Playtech mobile casinos are always worth checking out and players can enjoy all their favourite games on the go on any operating system or device. 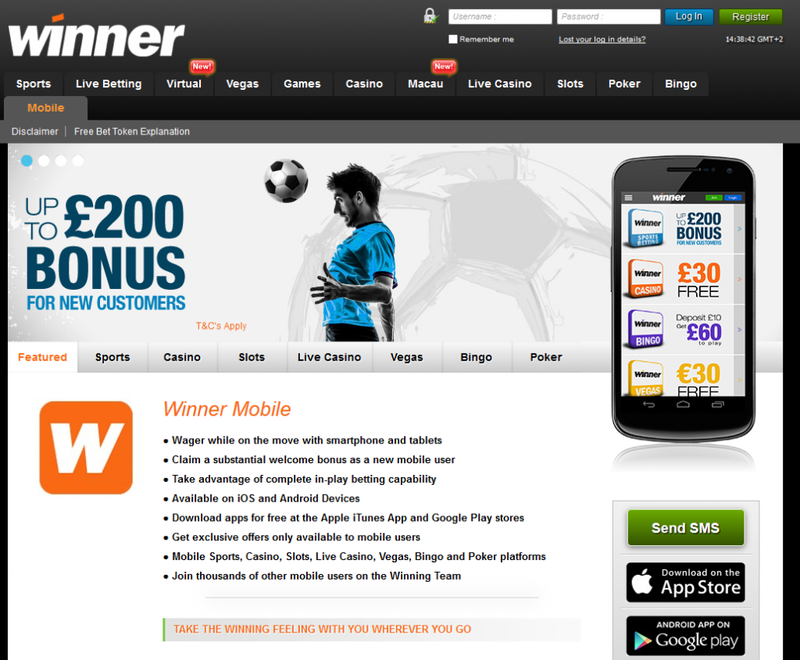 You can also download the Winner mobile casino app on Windows devices. The mobile casino is available for Android, iPhone, iPad, and all other mobiles and players can claim bonuses, make deposits and withdrawals, and enjoy everything the desktop version has to offer. Customer support is available 24/7 via live chat, email, and phone. There is also a FAQs section on the website which answers the most common questions about things like getting started, downloading the software, promotions, payment options, and more. Winner casino is a great choice for players looking to try out a new online gambling. They offer a fantastic no deposit bonus on sign up so you can try all the games for free. They have plenty of promotions and free spins offers for all players, and they use world renowned software provider Playtech. Visit the website and play for real money today with a €30 no deposit bonus.